Hotel on Queen under construction. Photo by Brenda Petroff/Torontoist. The heritage designation requires property owners wanting to demolish buildings or structures or making major changes to the exterior to apply to the city for a permit. Now, almost three years after the guidelines were originally proposed, a few underused sites in the designated area are starting to undergo redevelopment and revitalization. Construction is well underway on a tiny south-side lot, near Beverley. A large sign reads “HQ” but reveals little else of the burgeoning, sophisticated design hotel-to-be behind. The sign obscures the progress of what will soon be a small, luxury hotel featuring a fresh market restaurant and dining room, and a rooftop patio that will be open to the public for five months of the year. HQ Queen Street facade. Night Rendering. 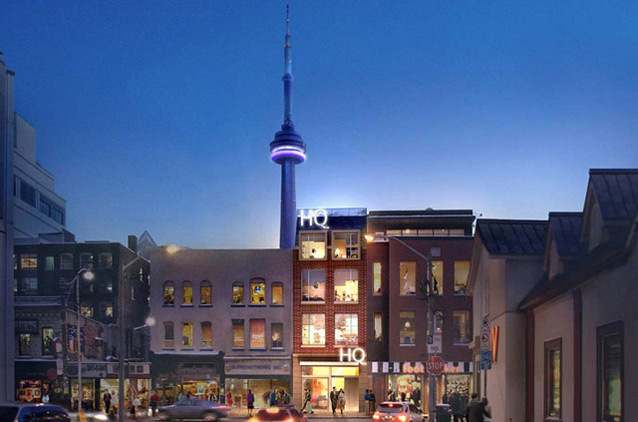 Courtesy of MadHouse Advertising Inc.
HQ (Hotel on Queen) is the first new project designed in accordance with the district’s rigid guidelines governing new buildings. A vision of old-meets-new design in a strip of Queen that has been begging for a facelift, the nineteen-roomed sleek hotel prides itself on providing for a new breed of customer, marketing its spacious suites to “people looking for an elegant European boutique experience.” Forum Architects Corporation, the lead architect on the project, was given the challenging task of producing the kind of architecture Torontonians typically appreciate: contemporary, yet contextually sensitive. For example, the two largest suites will be at the front of the building and will feature expansive, floor-to ceiling windows, showcasing private hotel activity to passers-by. In accordance with the guidelines, however, transparency is restricted to three-quarters of the façade on all levels above the ground floor, all windows are “vertically oriented,” meaning the vertical dimension is greater than that of the horizontal, and all window openings are symmetrical. In another façade compliance, HQ exhibits the required high quality building materials such as red brick, limestone, and slate. illuminated sign on top of HQ does not fit with the new guidelines. After HQ’s scheduled opening in July, focus will turn to the three adjacent, desolate lots, currently owned by Guess? Inc. The proposal for a three-storey Guess?/Marciano store was brought to the Committee of Adjustment on February 4, 2009. 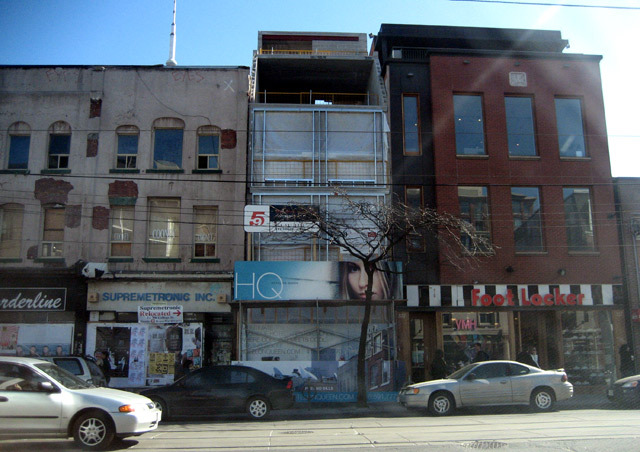 This article originally attributed a stance and direct quotation—that the creation of the Queen Street West Heritage Conservation District “was not intended to restrict development, rather to ensure that any future changes would complement the overall historic character of the area, ‘which results in part from a continuous street wall, defined by the cumulative character of building scale, mass, height, and proportion’—to Heritage Toronto, when that assertion, in fact, came from a study conducted by “[the City’s] Office for Urbanism, Fournier Gersovitz Moss & Associates Architects, William Greer, and Angela Carr” that was “initiated” by the City’s Heritage Preservation Services [PDF].